Mikkeller is back in Japan. 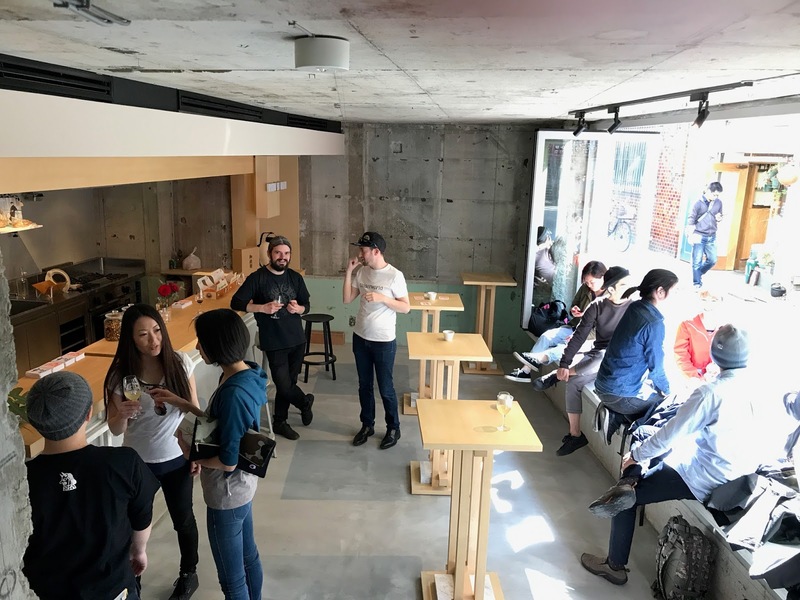 After numerous pop-ups they are back in a premises of their own and back in the heart of Shibuya. Although this time it's a quite different part of Shibuya, over the other side of Bunkamura to the old branch, in what is a very 'unique and interesting' neighbourhood. 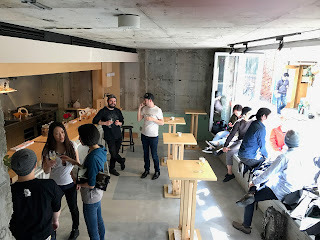 Previous to Mikkeller opening, the only times I had been to Dogenzaka were for gigs at the O-Nest. This area is very much a night life zone, with lots of restaurants, little bars, music venues and hotels where you can have a 'rest' if you find that you and your significant other suddenly find yourselves needing a lie down. The concept of the bar is fairly similar to last time, but in case you never made it there, here's what you need to know. 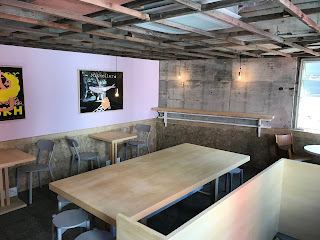 - Very nice looking place with lots of wood and bare concrete as you would expect. I may be biased but I think it's been done in a much classier way than usual here compared to the many other bars around that employ the same materials. The ground floor houses the bar, a few standing tables and a big wide windowsill that opens out into the street, allowing people to sit on both the inside and the street-side of it. Upstairs there are a variety of tables. Three small ones for two or three, a large table that can seat probably around 10 or maybe a few more if you budge up a bit and what is referred to as 'the best seat in the house', a table for three in the corner by the window, looking out at both the shrine and the love hotel. Something for everyone there I guess. - 20 taps, unsurprisingly dominated by Mikkeller beers. When I visited for the second time there were three of the house beers (the ones that usually take on the name of the area the bar is in). This time they are called 'Toriaezu ____' which is quite a nice touch from a naming perspective. Hats off to whoever thought of that. The beers are in a wide range of styles as you'd expect from a brewery like Mikkeller, but there are plenty that will please the kind of craft beer lover that rarely strays from IPAs and similar stuff. In addition to these, they had a few taps of Japanese craft, a couple of European imports and an interesting sake on. Most beers are served in two sizes, 200ml and 400ml. Some of the higher alcohol beers, the barrel aged stuff and the sour beers come only in the smaller of the two sizes. It's difficult to sum up the pricing in an all-encompassing way but I'll do my best. The house beers are ¥550 and ¥950 for the two sizes. 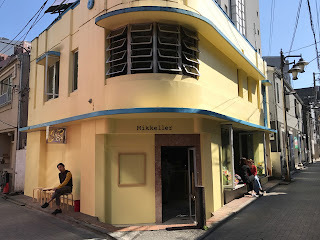 The more regular Mikkeller stuff ranges from ¥600-¥750 and ¥1100-¥1300 for small and large respectively. The wilder stuff mentioned above ranges from ¥900-¥1300 for the smaller size. The Japanese stuff is priced around ¥750 and ¥1300. - As you'd expect with a place that is focused on beer, it's no smoking. You can smoke outside round the corner a bit, I guess so that the smoke drifts away rather than in through the big open front window. They also have wifi as you would expect. Unlike the last place there is a kitchen and they have employed a baker to bake on site but not sure if that is completely in full swing yet. Sure it will be soon though. I guess there's not much else that I need to say about this place. You can probably tell that I am a fan. It's not going to be somewhere I go every night as I think I'd be broke and broken pretty quickly if I did that, as some of the beers here are not to be messed with. It's a nice treat though and the afternoon opening hours are very welcome. I think it's definitely a step up from the last bar and although it's taken a while for them to reopen, it seems like it's been worth the wait. As it's Mikkeller, there are automatically going to be people with strong opinions both ways about it, as they have their extreme lovers and their extreme detractors. Personally speaking, I think it's offering something that isn't available elsewhere in Tokyo and therefore a very welcome addition. I guess most people reading this will want to check it out sooner or later and will form their own opinions, but it's certainly not a place that can really be ignored.